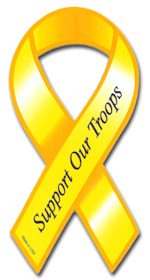 This 2" x 4" yellow ribbon car magnet is manufactured and printed in the USA. We print on premium quality, super-thick (.030) magnetic material with top quality, UV protected inks. I love the size of the magnet. Ordered these in the past; ordering again. This product lasts a long time. It's durable, keeps its color and stays attached to the car surface. I have purchased these in the past and knew exactly where to go in order to purchase more. Thank you! Shipping was fast. Items exactly as described. Thank you. Itema came as advertised. No issues. It fits my car better than the large one.